Cryoablation is a treatment that freezes abnormal or tumor cells. 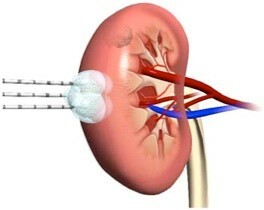 One or more needle probes are inserted into the tumor using CT or Ultrasound guidance and release a gas which decreases the temperature of the treatment area and destroys the abnormal cells. Depending on the size of the tumor, cryoablation can shrink or kill the tumor. This procedure can often be repeated if the cancer comes back (recurs), or if the tumor has an incomplete response. It is typically performed with moderate or conscious sedation without the need for general anesthesia. At the end of the procedure, there are typically one to three small incisions on the skin that are covered with a small bandage and no sutures. The patient is discharged home within 3-4 hours after the procedure. Most patients have few side effects following cryoablation. Listed below are a few common complaints from patients. Treatment site pain for a few days following treatment. This usually does not require more than a few days of prescription pain medicine and many patients only use over-the-counter pain medication. Mild fatigue for a few days following treatment. We have follow-up appointments scheduled with labs and imaging at customized intervals and are available by phone 24/7 for any issues that may arise.